Expedition engineers have been busy developing an app which can be used to test the dynamic performance of structures. The app is designed to quickly and easily assess the dynamic performance of structures, providing an idea tool for students to make the link between theory and practice. The phone’s inbuilt accelerometer is used to record vibration data, which is instantly post-processed within the app itself to give values that can easily be compared to performance criteria (natural frequency, response factors, frequency spectrum) giving both engineers and students a better idea of how structures actually perform. Raw and processed data from each test can be captured and shared through e-mail, Bluetooth etc. for further viewing and scrutiny outside of the app. Please test out the app on whatever structures you may be working on/ studying/ generally interested in and let us know how you get on or if you have any ideas for further development. 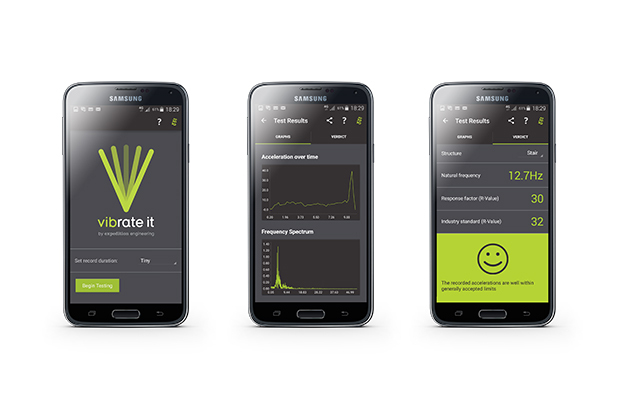 We are proud to release Beta Version 1.0 ‘Vibrate It’ for Android which can be downloaded for free from Google Play here. Read more about the background and development of the app in our Thinking Piece and in the July 2015 issue of The Structural Engineer.